Sea view suite 41/42 sqm. Suite mare e monti 41/42 sqm. Family deluxe room 24/25 sqm. 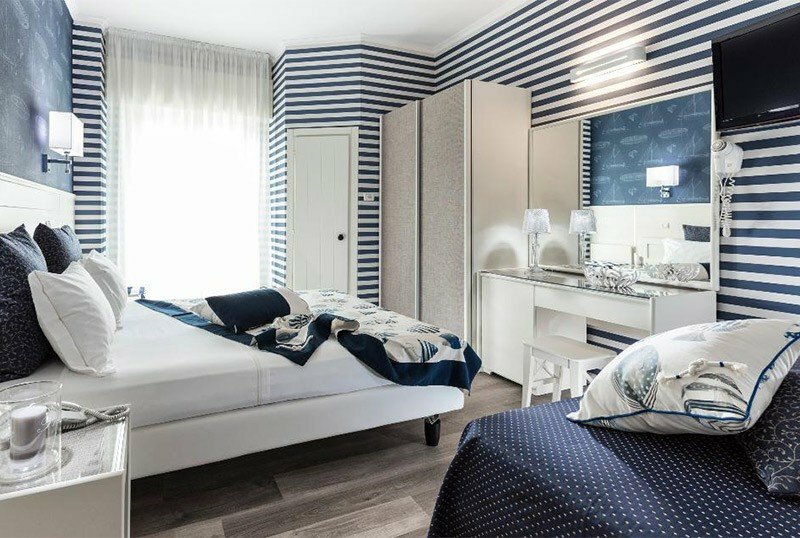 Hotel Atlantic Riviera is a 4-star hotel in Misano Adriatico, in a pedestrian area just a few steps from the beach, with a panoramic swimming pool, hydromassage and private parking. Family-run, it offers typical Romagna and international cuisine. Admits small animals on request, with additional cost for cleaning and final sanitization. The hotel is located in a pedestrian area of Misano Adriatico, a two minute walk from the beach and five minutes from the Mare Nord Park. Balcony, electric shutters, electronic lock, independent air conditioning, free WI-FI, 32 "sat and digital terrestrial TV, beach towel / swimming pool, private bathroom with shower and courtesy line, hairdryer, safe, direct telephone, minibar, sofa. DELUXE : renovated, with a size between 18 sqm and 19.5 sqm, some with sea view. FAMILY DELUXE : recently renovated 24/25 square meters, some with sea view, are the ideal solution for families who need more space. JUNIOR SUITE : 23/25 sqm with new furniture, sitting area, courtesy set with kettle. SUITES : large size (41 sqm), fine furnishings with a view to the east on the sea and to the west hinterland, sitting area, welcome bottle of prosecco, courtesy set with kettle, bathrobe and slippers, free national newspaper on request, afternoon tidying up. FAMILIES: family solutions and connecting rooms available. Panoramic swimming pool with hydromassage and solarium, panoramic wellness relax area (turkish bath, chromotherapy, emotional shower) upon reservation and payment, garden, free use of bicycles, american bar, open-air porch, panoramic terrace, reading room with small bookshelves, lounge, satellite TV with large screen, elevator, laundry, beach towels, newspapers, airport / train shuttle service (free). PARKING : discovered in the hotel (available for all), covered in the hotel (by reservation only). CONVENTIONS : beach, amusement parks. Possibility of shuttle service and organization of excursions. PETS : small pets allowed, on request with additional cost for cleaning and final sanitization. BREAKFAST : international, buffet with homemade desserts, fruit and savory proposals. LUNCH AND DINNER : choice between 3 and more menus based on meat and fish, inspired by the national and regional tradition followed by a buffet of vegetables, side dishes. Organic products and extra-virgin olive oil of own production. At the end of meals, cakes and homemade cakes. VARIATIONS : vegetarian and vegan cuisine (on request). OTHER: theme dinners are organized. In the hotel : swimming pool for the little ones, games in the garden, strollers, bicycles with seats, indoor playground area, bottle warmer, pediatric service and baby sitter. In the room : cribs, beds with protective sides, night light, sockets and socket covers according to CEE standards, bath tubs. At meals : flexible hours, table seats, cutlery, set of dishes and colored glasses, baby menu, baby food preparation. On the beach : baby and mini club, playground area, mini soccer fields and mini basketball, trampoline - trampoline, baby toilet, nursery with changing table and tubs, anti-seize bracelet. Hotel Atlantic Riviera has a 12 mx 7 m panoramic swimming pool, located on the seventh floor of the building. Present area for children 40 cm deep, Jacuzzi, solarium with beach umbrella and sunbeds. The hotel has a 70 sqm wellness center inside the structure. It has an outdoor swimming pool overlooking the sea, a Jacuzzi, a Turkish bath, emotional showers, aromatherapy and chromotherapy, as well as a relaxation area. Admission is free, available upon reservation for guests over 16 years. The structure has an agreement with the Bagni Salvatore, equipped with a mini-basketball court, soccer field, canoes, playground area, nursery, baby toilet, anti-seize bracelet. Prices are per person in a double room, full board for a minimum stay. of 7 days. One CHILD up to 5 YEARS FREE in room with 2 adults, price per day per person Euro 86,00 full board! Hurry up! the offer is limited for the first 5 bookings and is valid only for a minimum of 7 days in half board or full board. Book now: FREE for you 1 entry into our new relaxation area! Turkish bath, emotional showers and Jacuzzi with sea view! Book now! There are last rooms available! Located on the top floor of the hotel, its spectacular panoramic window gives a magnificent natural light to this space dedicated to relaxation and well-being. EARLY BOOKING: the beach service is IN GIFT! Book your beach vacation right away: we'll give you the complete beach service at our Super Lifeguard! Many good reasons to choose us: the excellent location, the renovated rooms, the panoramic swimming pool with Jacuzzi, the new relaxation area, the good traditional cuisine, the beach n. 1 within walking distance. Book and remember that the offer is limited to the first 10 bookings in a Deluxe room for a minimum of 7 days in half or full board. Anticipate the summer: June at the sea! Challenge yourself! We are waiting for you!